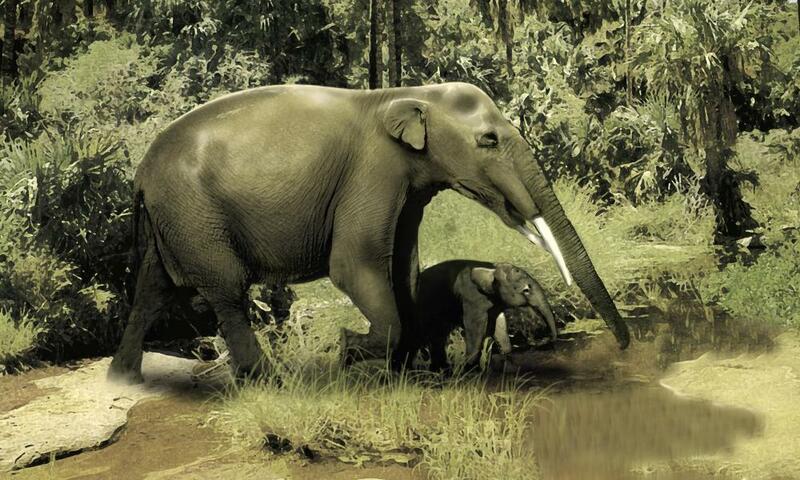 Long ago, perhaps even before the celebrated mists of time, there was a great family of animals that lived in Africa. The story starts some 10 million years ago and then the family grew and spread out. Around three million years ago, a branch of it spilled into Europe and Asia. As the animals moved into new territories, they adapted to more northern climes. Eventually, some crossed the bridge of Beringia, migrating from north-east Asia into North America. It sounds a familiar story. Surely this is all about our ancestors – the African origins in the Miocene, with key fossils appearing from ancient sediments in Kenya; some of this group colonising Europe and Asia; the march into the new world. But this is not the story of hominins: of australopithecines, paranthropines and Homo. This is the story of the elephantines: of mammoths, Loxodonta and Elephas. The most striking characteristics of living elephants – trunks and tusks – had appeared in their gomphothere ancestors by 20 million years ago. For a large animal with a short neck, the trunk was an extremely useful development, allowing these proboscideans to grasp leaves and bring them to the mouth, thus providing an evolutionary advantage. The development of a trunk and the transformation of incisors into tusks were accompanied by a change in the shape of the skull. Inside the mouth, the teeth were also changing. A short jaw left little room for a full set of molars, while the teeth needed to be able to sustain a long lifetime’s worth of heavy wear. Evolution provided a neat solution to both problems. Rather than having a whole set of premolars and molars crammed into the mouth at the same time – as in your mouth – there was just a single, large tooth occupying each side of the upper and lower jaw at any time. As this tooth wore down, another would be growing behind it, ready to slide into place when the worn-out tooth fell out, providing the animal with up to six sets of teeth in a lifetime. The teeth of fossil gomphotheres and elephants preserve a signal of their diets. The ratio of different isotopes of carbon in the tooth enamel shows whether a particular individual was focusing more on browsing on leaves or eating grass. The grasslands of Africa first began to spread around 10 million years ago and isotope analysis reveals that late gomphotheres and early elephants switched to eating mainly grass around eight million years ago. 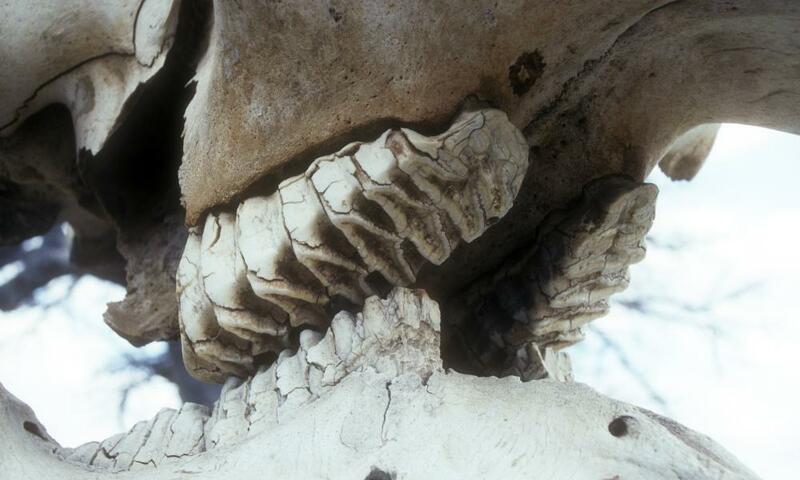 In elephants, this switch is reflected in another change to their chewing teeth, which became three times as tall, with a proliferation of enamel ridges. But these adaptations to an abrasive diet appeared around five million years ago, three million years after that switch from soft leaves to tough grasses. With the degree of resolution we can achieve when looking far back into the past, it’s often difficult to know what came first – a change in behaviour or in anatomy. But in this case, it’s very clear: the changes to teeth lagged millions of year after the change in diet. In our evolutionary narratives, the organism itself often seems to play a passive role: a powerless victim, almost, of changes to its environment or mutations in its genes. But the tale of the elephant’s tooth is somehow different, a change in behaviour clearly precedes a change in anatomy (and the underlying genetic instructions for tooth development). Perhaps we shouldn’t be surprised by this: developmental plasticity means that the final shape of an animal’s body is determined not only by DNA but also by external factors. And animals are more flexible in the way they interact with their environments than we sometimes assume. As elephants show, the source of novelty in evolution can come from behaviour rather than from genes. It’s just possible that this type of change, originating with a change in behaviour, played an important role in human evolution. Around two million years ago, there was a large shift in body shape away from short legs, which first appears in Homo erectus. It’s likely that many of the new anatomical features, from longer legs to enlarged gluteal muscles and chunkier achilles tendons, are related to increased efficiency in running. If a group of humans began to run regularly, perhaps allowing them to hunt or scavenge more effectively, anatomical changes would follow, especially among the still-developing youngsters. Once running became an important part of behaviour, any mutations that enhanced it would be favoured. But the real source of novelty, perhaps, was that change in behaviour and not a genetic mutation. The great proboscideans that roamed the African landscapes where our own ancestors evolved remind us that evolutionary novelty doesn’t always originate in the genes.